Summer nights at the farm don’t get much better than a few cold beers and grilled corn on the cob. Seriously–we’re easy to please these days! It’s been hot and stressful out in the fields but the evenings have made up for the incredibly long days. Cracking open a cold one and biting into our first grilled corn of the season has been the highlight of our summer. We’ve waited all year for sweet corn and damn….it’s even better than we remember! We paired our grilled corn with a jalapeño-honey butter that was so dang good that I made cornbread muffins last night and slathered them in this butter for breakfast. The recipe for the butter makes more than you’ll need for the corn but you’ll find plenty of uses for it all week long. I hope you all enjoy this simple farm fresh recipe as much as we do. Fire up the grill, crack open a cold one and dig in! Prepare the butter by lighting an outdoor grill to medium-high heat. Add the peppers directly onto the grill grates and grill for about 5-7 minutes, or until charred on all sides. Remove from the heat and let the peppers cool for about 10 minutes. When cool enough to handle slice the peppers in half and removed the seeds. Dice the peppers and add them to a bowl along with the butter, honey and salt. Mix until well combined. Place the corn on the (already preheated) grill. Cover, and cook until lightly charred, turning occasionally. About 10 minutes. 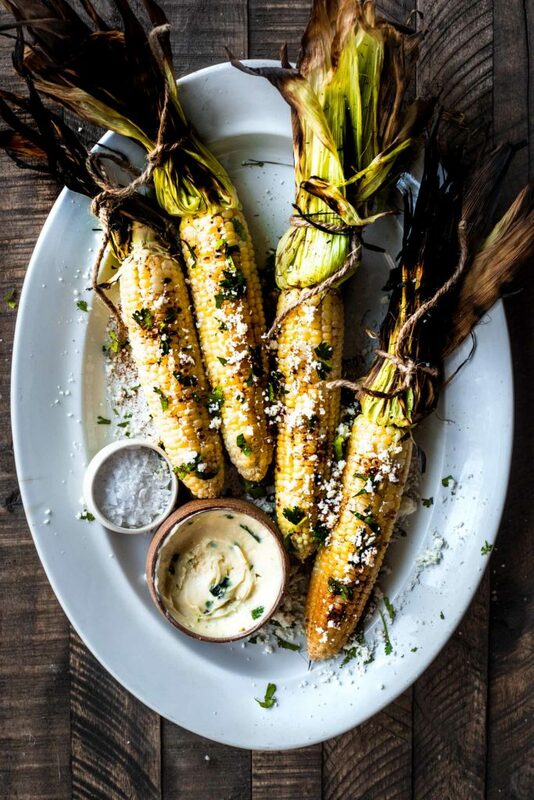 Place corn on a serving platter and brush with the jalapeño-honey butter and sprinkle with chili powder, Cotija cheese, cilantro and a pinch of salt.